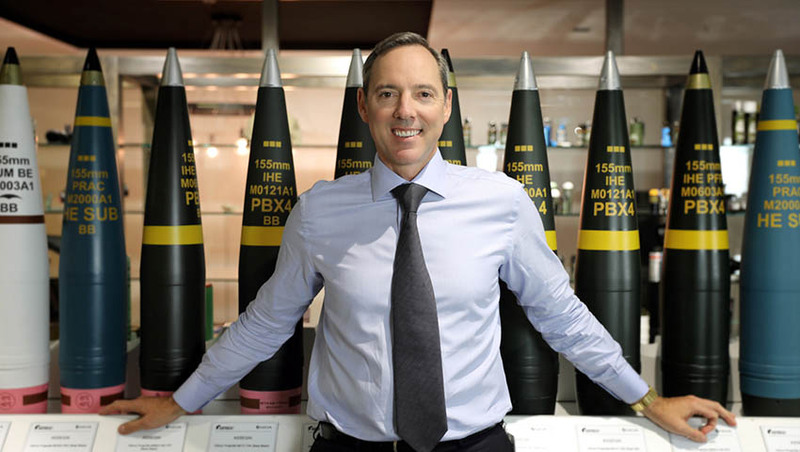 With the award of several major contracts in the last few years, NIOA has become one of the largest suppliers of non-guided munitions to the ADF, which is no small achievement for a home-grown Australian company, but the meteoric rise didn’t happen overnight. Like most successful companies, NIOA’s achievements have been underpinned by a constant drive to extend their capabilities, and a determination never to rest on their laurels. In NIOA’s case, it seems a consistent component of their success has been a tenacity to stay the course even when the outlook seemed particularly uncertain. NIOA’s ability to work in complex technical and highly regulated environments was founded over 40 years ago in the commercial firearms and ammunition industry. As the industry became ever more regulated in the 1980s and into the 1990s, many of NIOA’s contemporaries opted-out and left the industry for greener pastures. The company remained resolute and rather than seeing the new operating environment as a barrier to success, NIOA saw it as an opportunity to consolidate and grow its skills and capabilities to meet the challenge. Managing director Robert Nioa told Defence Connect, "If I was to think about the underlying principles that led us to where we are today, they would have to be persistence and a preparedness to take a very long-term view when investing in the business. In such a highly regulated and specialised industry like ours there’s no shortcuts to success. "We never had the benefit of incumbency, so we had to demonstrate our commitment through investing in new capabilities and then winning the business. We invested heavily in both specialised infrastructure but just as importantly in industry knowledge and technical expertise in order to make the next leap forward." The process of developing the now world-class technical and regulatory skillset allowed NIOA to pursue new opportunities within the law enforcement market for the supply of ammunition and firearms to police and tactical units. After several years, NIOA's persistence paid dividends. The company amassed an enviable list of contracts, supplying both federal and state police forces with the now universally recognised Glock handgun along with various natures of suitable ammunition and ancillary equipment. To this day, NIOA still provides extensive maintenance and training support to over 60,000 Glock handguns in the Australian and New Zealand law enforcement markets. Building on the initial success, skills and expertise developed supporting Australian and New Zealand law enforcement, the company set its sights on the highly-lucrative defence munitions market. Dipping their toes into several smaller defence contracts, NIOA set its sights on an ambitious plan to deliver the MK47 LWAGL (lightweight automatic grenade launcher), one of the most technologically advanced direct fire weapon systems available, into service with the ADF. After a significant investment in time and resources, many years, and a few speed bumps along the way with the LAND 40 Phase 2 tender process, NIOA had its first taste of success with Defence. The trials in the early days of engaging with Defence enabled NIOA to invest in the company's infrastructure, staff and approach to developing key relationships that would serve as the foundation of the company's later success with Defence, in particular key investments in manufacturing facilities, technical expertise and training enhanced the company's ability to compete with larger global companies and secure work with global titans like Rheinmetall Waffe Munition. "Of course, an essential factor in bringing that all together are the strong relationships we have with our OEMs, the ADF, and even right down to the relationships between our own team members. I find people often forget the importance of relationships in business, and it can often mean the difference between success and failure for a company that is otherwise technically proficient in all other areas," Nioa explained. NIOA successfully delivered 222 grenade launchers into service with the ADF, on-schedule and with ongoing sustainment and maintenance programs to support the weapon system through its complete life cycle. The Commonwealth Project Office and NIOA won accolades for the successful management of the project, with NIOA enhancing its reputation for honesty and ability to meet technical challenges during the project delivery phase. The LAND 40 Phase 2 project also established NIOA as a defence prime in its own right, something that few Australian SMEs ever manage to achieve. The early success enabled the company to build relationships both in government and within Defence, which would serve as the basis for future success, particularly as the government began to invest heavily in Australia's sovereign industry capability. In the background bubbling away, NIOA had its sights set on securing larger Defence contracts that were under consideration in the halls of power of Canberra, namely the LAND 17 Phase 1C.2 Future Artillery Ammunition Project and the Major Munitions Contract (MMC), at which NIOA threw all the weight of its strengthened and expanded team. By taking advantage of its strong, long-term partnership with one of Europe’s largest defence manufacturers, Rheinmetall Waffe Munition, NIOA was able to tender the advanced 155mm Assegai family of artillery munitions for the LAND 17 Phase 1C.2 project. The Commonwealth concluded that both the technology and the bid package represented the overall best value and a successful win for NIOA followed. NIOA’s expertise in the field of supply and support of munitions was growing and their attention was quickly turned to the emerging bid for the MMC. NIOA applied its munitions expertise and long-term partnerships from small calibre through to large calibre and distilled that into a successful bid that resulted in the winning of the MMC tender. This included 22 separate configuration items from small arms 5.56mm ammunition all the way through to 120mm tank ammunition destined for the ADF’s fleet of M1 Abrams tanks. With these wins under its belt, NIOA had amassed a significant portfolio of large-scale munitions projects, making it one of the largest suppliers of non-guided munitions to the ADF. With many more smaller scale contracts rounding out its portfolio, such as the NZDF Sniper Weapon Replacement Program and the supply of Glock sidearms for the entire New Zealand Defence Force. Recent announcements of a tenancy at the Benalla munitions facility in Victoria and its joint venture with Rheinmetall to set up a high-tech ammunition forging plant in Maryborough, Queensland, sees the company firmly set on the road to domestic manufacture for an increasing portfolio of munitions for the ADF, with a clear potential for additional export opportunities. With both LAND 159 Small Arms Replacement and LAND 4108 Direct Fire Support Weapon Replacement projects starting to take shape, NIOA's experience, expertise, attention to quality and detail place the company in a prime position to expand upon the successes that have established the company as an Australian munitions powerhouse.